Many amateur mechanic make the mistake of switching sides when re-installing pedals. Pedals have a different thread pattern on the left and right side. 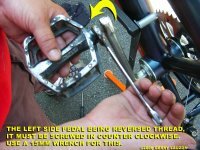 The right side pedal is installed and removed the usual way, clockwise in and counter clockwise out. The left side goes in counter clockwise and comes out clockwise. The left side is reversed thread. 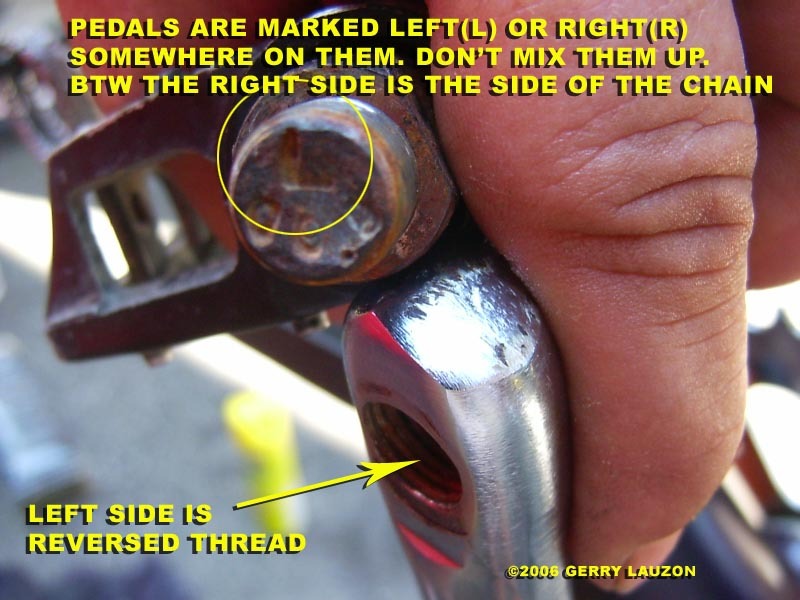 Both pedals are usually marked near the thread with a "L" and a "R" to identify them. Take note that pedals come in two different sizes threadwise. Bring the old ones with you if you need to replace them. 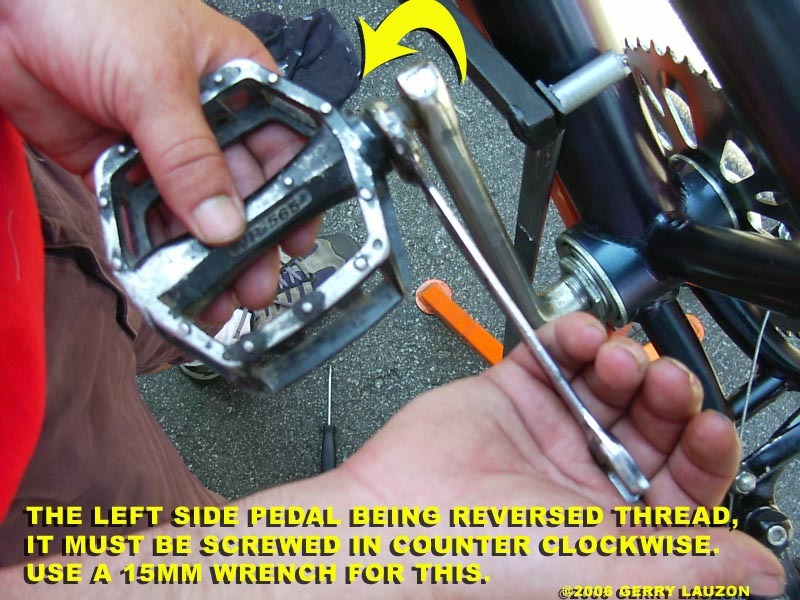 The tool you will need for pedals is a 15mm open wrench. Perfect timing on this post! I'm going to do a pedal switch tomorrow and I can never remember which direction each side screws in/out. I knew this post would be helpful! I appreciate everybody letting me know that they are helping you out. tuco: keep some good soap on hand and have fun. Whatever you do don't handle your digital camera while working in grease...I know, trust me. this helps your readers, happy new year,regards Chris. My pedal crank nut keeps working loose. It's tricky to tigten as it's recessed into a hole in the base of the crank. Is there a special tool for this? Why is it working loose? Hi Gerry. I have a crappy Supercyle Bike from Canadian Tire, and I want to change the pedals. I've tried and tried, but it seems they are stuck on. Is it possible that a cheap bike like this would have pedals that are welded on or something? Anna, no such thing as welded pedals. Unless you bought the bike used and the previous owner decided to do that. Some are harder to remove than others. Use a hammer with the 15mm open ended wrench, but for God's sake be careful. I had such a problem last week where the arms were made of aluminium and oxydized with the steel from the pedals. Took 45 minutes to convince them off. Good luck. is there an easy way to remove the pedal bearings and fix or replace them depending on the condition of decay? should i just take it to a bike shop and have them do it. 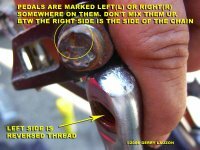 i'd prefer to learn how to do it myself if its possible but i can't figure out how to remove the bearing. It's pretty easy, just remove the cap at the end of the pedal. You will see a nut. Unscrew the nut and the whole thing should come apart. Unless you have some vintage pedals or expensive ones that you can't replace, just buy new ones. They're not that expensive. Great blog. Thanks for the comment from Chris Bryant - I screwed my pedals on the wrong sides when I got the bike (idiot) and now the thread in the crank arm is all messed up so I'm going to try your advice on clearing it by screwing in the other way. thanks for the time taken to write this blog. i have some primo plastic pedles and they just wont come of. ive tried boiling water, hammering, and brute force. is there any thing else i could try ? Mikey, check if they are not installed on the wrong side of the bike. Happened to me before so you'll have to reverse everything and pray that the thread wasn't screwed up on the crank arms. Sorry, I think you'll need to replace that crank. the pedals have stopped turning on my sons mongoose I've removed the nuts on the end of the pedals but they still wont come out. Any advice?? If you look at the pictures, click on them for a larger version, you'll see that the pedals are taken off by unscrewing them at the base. Remove one and bring it with you when shopping for a new one. Take one out and measure the diameter of the shaft. You'll have your answer.